While Nikon’s COOLSHOT Rangefinders are great for displaying distances to the pin, they are also useful for finding distances to unwanted objects (hazards, trees, etc.) on the golf course. Knowing these distances removes the stress of the unknown, allowing you to focus on your swing. 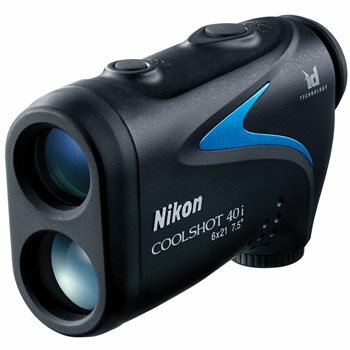 The Nikon COOLSHOT 40i Golf Laser Rangefinder offers the same high-quality performance as the 40 while also including ID Technology and Distant Target Priority mode. With ID Technology, the 40i displays slope-adjusted distance and to-the-target distance, allowing stress-free club selection when facing a shot with elevation change. ID Technology also eliminates second-guessing or how far uphill or downhill a shot will play. Another feature of the COOLSHOT 40i is Distant Target Priority mode, which is now offered along with First Target Priority mode. The Distant Target Priority mode displays the distance of the farthest subject, which is useful when measuring overlapping subjects in wooded areas. Got one of these for my birthday through Amazon and has not worked properly. The first target mode does not work that well and always gives readings of objects behind pins but no problem with readings to larger objects or bunker faces. Every now and then you get a correct reading and the lens has water spots on it even though it has not been subjected to rain etc. I cannot find a contact to see if it would need to be adjusted or repaired....Vernon.